When you need latches for commercial or industrial grade swinging gates, you need something more than the light construction of the typical latches sold for residential use. You need heavy-duty latches with the convenience, durability and tamper-resistant security features that protect your facilities, but that provide fast, easy access from both sides of the fence. International Security Products has designed and manufactures industrial swinging gate latches that incorporate all the features that your commercial and industrial applications demand. Don’t settle for residential grade latch hardware. Our chain link fence gate latches are designed for your specific needs. 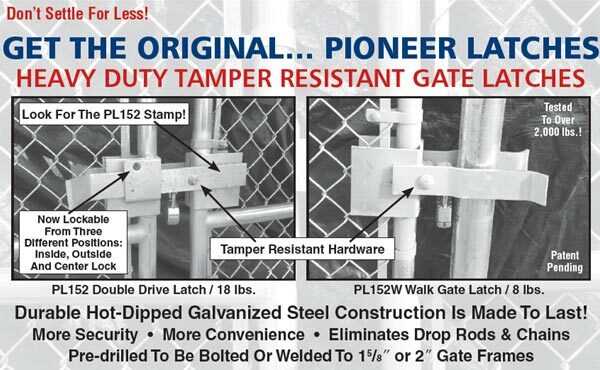 Our PL152 Industrial Gate Latch (also referred to as the Pioneer Latch 152) is the most widely used security chain link fence gate latch. Its maximal design for security and ease of use has made this gate latch an industry standard. The PL152 latch has become a must-have product for security gates. Our PL152 latch is made by International Security Products in the USA. This latch is a heavy duty commercial double drive gate latch that weighs 18 lbs. It eliminates the need for a drop rod or center stop making the gate easier to open and close. Our latch has a hot dipped galvanized finish and features heavy duty steel construction. The spacing between the two vertical frames of the double drive gate must be between 3 ½” to 5 ½” apart from each other for the latch to operate without any modifications. It is constructed to either be welded or bolted on to 1 5/8″ or 2″ gate frames and has three convenient locations for the padlock, one that is centered and below the latch which is accessible from both sides of the gate, and two more locations on the inside or outside of the latch and gate. The PL152 latch has also been recently improved, we have added “tamper-resistant” hardware to the latch, making it even harder to disassemble once its on the gate, unlike other latches on the market. For availability and additional pricing information including freight cost, you can either contact International Security Products directly, or call your nearest Merchants Metals, or Master Halco facility. 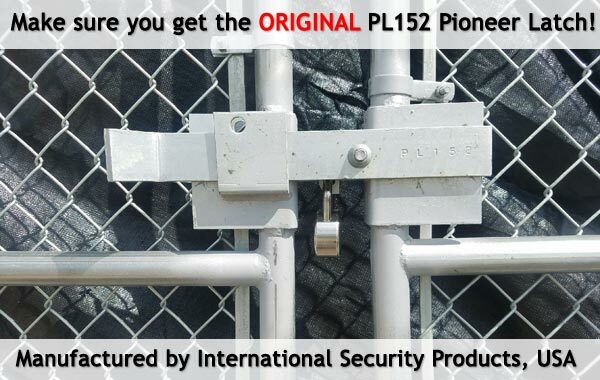 Make sure you get the original PL152 manufactured by International Security Products.